Sesobel is a Lebanese NGO founded in 1976 acting as a Social Service for the Welfare of Lebanese Children. Their work is highly known and very few are the chances for someone living in Lebanon to have not heard of them yet. Rotary Clubs a,k.a Lions Club are an international organization known for its clubs which usually attract people from different walks of life and expertise who are usually organized as chapters that work towards addressing and improving many social issues while upholding ethical behavior. When a Lions Club is organizing workshops and courses in order to support an association like Sesobel, no matter how busy you are, you tend to say "I'll be there". 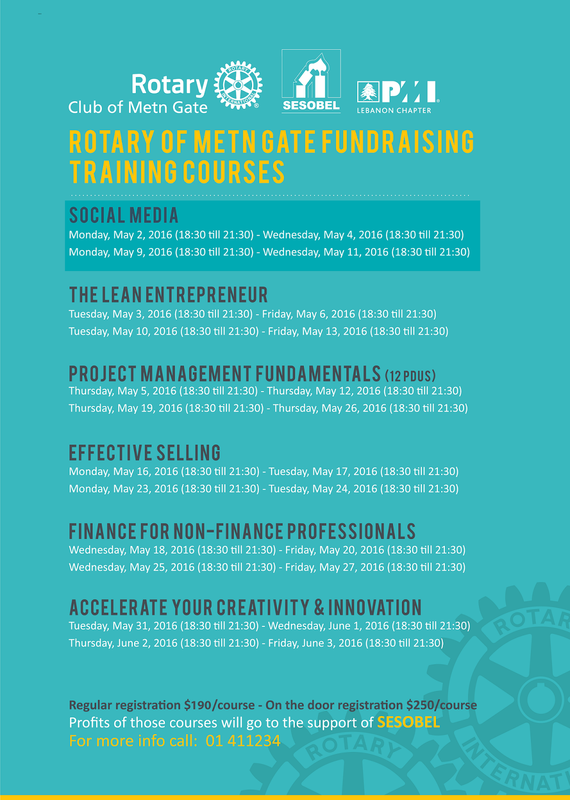 That's what happened when a friend of mine reached out and proposed I become part of this effort, organized by the Rotary Club of Metn Gate. 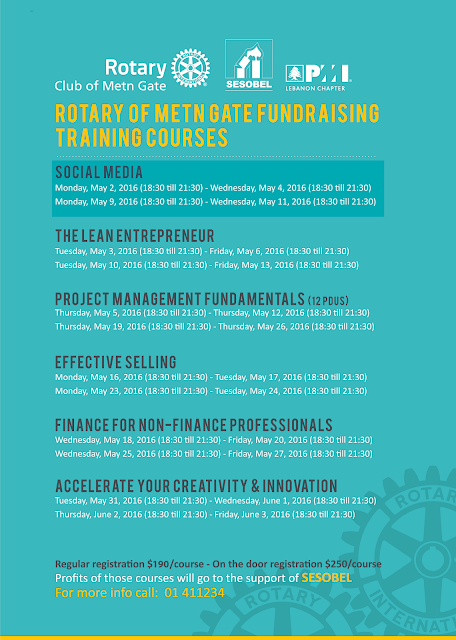 So on May 2nd, 4th, 9th and 11th, I will be facilitating 4 sessions of 3 hours each discussing various aspects of social media. But those of you who know me or have attended any of my workshops, know it's never a clean cut syllabus but more of an explorative journey where we dive into the subject and navigate it based on the audience's feedback and interaction. If you are interested in my workshop or any of the other workshops offered by other distinguished professionals, I strongly urge you to subscribe on the following link a.s.a.p. You would be gaining valuable insights and also giving back to those in need of assistance via Sesobel. For additional information and registration. My long experience in facilitating courses and workshops has taught me that no two audiences are alike, much less when you are moving into an entirely new country and culture. The EUROMED PPRD SOUTH II program landed this past week in Jordan. A country rich in history tradition, sunshine but most of all in warmth from its people. As a Lebanese, I can assert that there is a special bond that always connects us Levantines with each other. We have shared history, geography, climate, traditions, family ties not to mention woes and troubles. Jordan has always been one of the most welcoming places I have visited and I was extremely enthusiastic to be back there again, this time with the PPRD team. 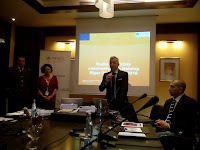 In case you have not caught wind of what our workshops are about, they are part of a bigger effort to prepare mediterranean countries to face crisis and disasters. Our team addresses Communication in times of Crisis more specifically and helps countries create the awareness needed to build their communication teams and apply the right communication strategy for those difficult times. The audience in Amman was similar in structure to what we had noticed in Beirut, in the sense that attendance extended beyond the Civil Defense forces to include members of various ministries and official bodies. We did however have members of the (official) press present with us like in Algiers. The Jordanian hosts' enthusiasm for the learning process was no less than their counterparts in previous workshops. Although hesitant at first, and not sure what to expect from this workshop, they quickly got into the motion, with some taking-on leading roles among the group in various exercises, such as the simulated TV interview or the Social Media Crisis simulation. 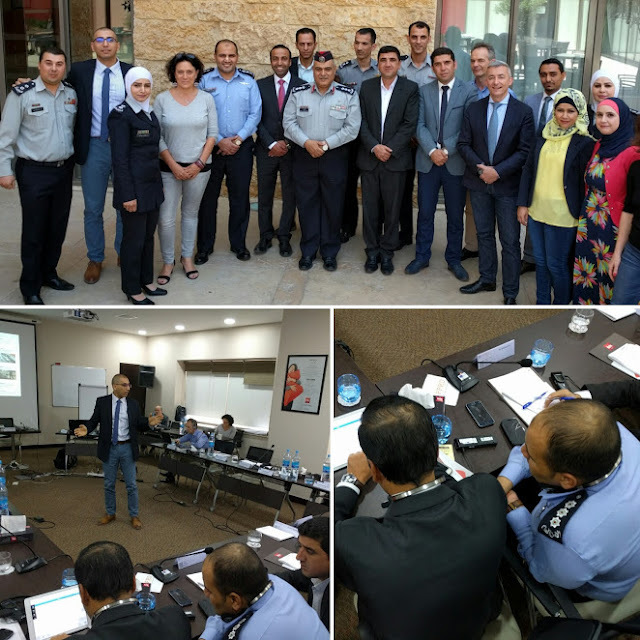 The Civil Defense members extended their hospitality further by offering us an amazing trip into the ancient but well preserved ruins of Jarash, located roughly 45 minutes north of the capital. This trip was extremely exciting for me personally, as I am a big fan of historical sites. My previous shorter visits to the country had not left me enough time to go admire such beautiful pieces of history. In our free time, we also managed to uncover beautiful parts of a city that is friendly, safe, vibrant and with a great potential for more achievements. We left hoping that our visit helped bring valuable insights to the brave men and women of the civil defense and other public protection services with whom we managed to build friendship and camaraderie ties. As for me, I can only say one thing: See you soon Jordan!! 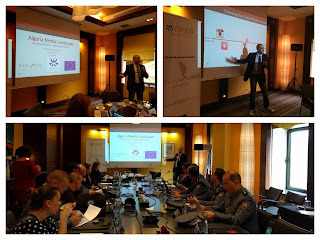 Within the series of seminars and workshops, part of the EUROMED PPRD SOUTH II program. 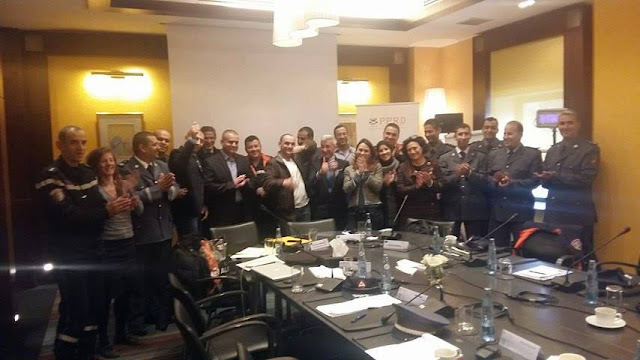 Funded by the European Union, and after a previous stop in Beirut, we headed for the Algerian capital where the Civil Protection Communication Team was eagerly waiting to be part of this global endeavor to empower similar public bodies in Crisis Communication. On a personal level, this was my first trip to Algiers, a place not to be missed. The city rich in history, architecture and cultural diversity is impressive to say the least. The welcome we received by our hosts was beyond compare, even in my home country Lebanon where we usually take pride in how we receive travelers and guests. I am here inclined to start thanking people by name but that would simply mean I would be either leaving someone out or just having a blog post consisting mostly of names of fine people who put their lives daily on the line to save others, so I will just throw out a big thank you to everyone involved in making our stay a memorable one. In terms of work done, the attendees came from various units within the Algerian Civil Protection located in different parts of the country. We were also graced by the presence of local public and private media institutions representatives. I have always been a fan of having more varied profiles in workshops and courses I have facilitated over the years. This was definitely the case, as different backgrounds joined in to deliver more insights into our discussions, to allow a more comprehensive approach to hands-on exercises and to keep the conversation alive from different perspectives. Our workshop which focuses on a 360 approach to communication in times of crisis, took off with the usual theoretical approach to the subject on day 1 followed by a custom conceived crisis scenario mimicking a potential incident that could happen in the country. 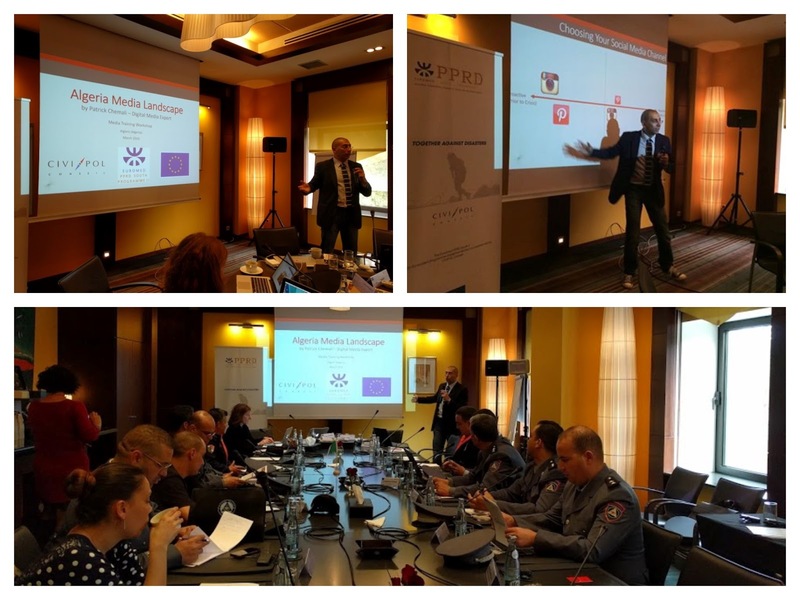 The hands-on approach lasted for the remaining 3 days tackling respectively communication with the written press, TV and Radio interviews and culminated in the digital and social media communication part where we discussed the various strategies and tactics alongside the tools that can be used. Each phase of the work saw the attendees investing themselves fully in role playing and tackling the hard interview questions or the snappy tweets and comments in an extremely professional way. If something stood out most from this workshop, it was the team spirit with which everyone was working. 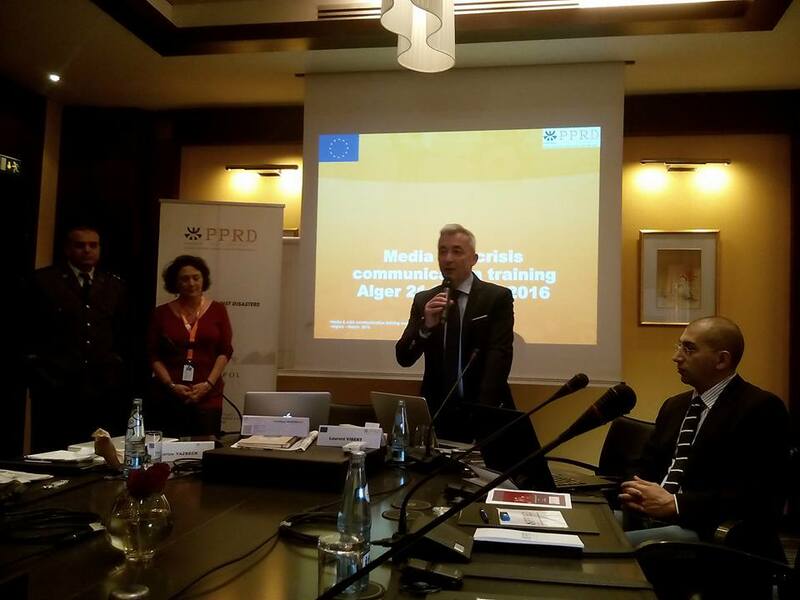 Boundaries between the media and the civil protection members dissolved quickly and they were each bringing their own expertise to the mix. This has been one of the most fruitful workshops we have facilitated during the whole program. There is no greater reward for a facilitator than to see that the information is flowing in a productive way and seeing that one's recommendations are being followed. Algeria, it has been both a pleasure and privilege to have met the brave people that go beyond the call of duty in protecting the public. Here's to continued success! Next on our agenda is Jordan, where we will be conducting a workshop in Amman on the 18th of April. An amazing day out in Algiers with the awesome members of the Algerian Civil Protection members, discovering the city and their impressive headquarters.